Searching for an event venue when planning your corporate meeting or conference can be challenging. Before rushing to find the closest meeting space near your office take a minute to consider these 5 things that can determine whether your meeting is a success or failure. 1. Location– There are hundreds of event spaces in Nashville. When determining a good location for your event it is important to consider from where people are traveling. If it is a local or regional event where people are traveling by car, it is important to find an event venue that is convenient to interstate travel and that is easy to find. The last thing someone wants to do after a long drive is get lost when they get into town. If your guests are traveling by plane you want to to be no more than a 15 miles away. Whenever possible, it is good to have restaurants and entertainment within walking distance or at most a short cab ride. Your guests will appreciate being able to unwind after a full day of training. Venue Quality– It is important to make sure you meeting space is consistent with the image you want to give your clientele. I once booked a meeting at what seemed to be the perfect venue over the phone. It was a last minute change since our regular meeting place had double booked, so I didn’t have a chance to see it in person. It could accommodate a lot more people than we had coming to our event, and the tables, projector screen, and setup was all included in the cost. It was in the heart of downtown Nashville and had easy access to the interstate. However, when I arrived the next day to prepare for the event, the lighting was dull, the colors were dull, and there was a musty odor. Make sure to visit the property in person, and if you cannot, ask for photos of the property or meeting areas. Size– Often, large conference centers use there grandness as a selling point. If you are holding a large conference this could be a good choice. However, consider how long the walk will be for you participants. Also, parking at convention centers can be a nightmare. An event venue that can scale to meet your needs is always a good choice. 3. Cost– Sticking to your budget is an important part of planning your meeting or event. Since the quality of the venue will set the tone for the event it is a good idea not to cut corners when it comes to choosing your venue. That said, it is a good idea to find out what the rental fees cover. Some venues may be all inclusive with your meeting needs, but that is very rare. Most often, the venue offers a menu of a la carte services. Things like catering, table set up, audio/visual can add up quickly when the venue doesn’t allow you to use your own vendors. 4. Catering– Catering options vary from venue to venue, but almost all venues require you to use their services. Occasionally you will find a venue that will allow you to bring in your own caterer and in even fewer cases you can bring in your own food and drink. If you find a quality venue that allows outside vendors it will be worth investing a little more in that event venue for the huge savings you’ll see in your catering costs. 5. Lodging Options– Obviously hotels have lodging on site, but if they are hosting more than one conference, will they have enough rooms available? Usually the answer is yes, but it would be wise to see if you can block off a set number of rooms for your guests. Sometimes the perfect event venue won’t have lodging on site. In that case there needs to be a suitable hotel within walking distance or a 5 minute cab ride. We hope these tips will help you in your search for the best event venue to meet your needs. Looking For An Event Venue in Nashville? 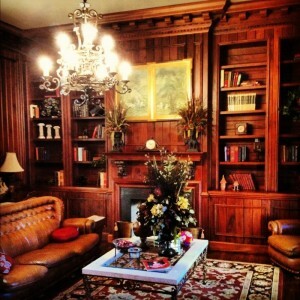 The Historic East Ivy Mansion is an event venue conveniently located in the heart of Nashville. We are less than 1/2 mile from I24, I40, and I65. East Ivy is within walking distance of the entertainment district of Nashville which includes live music, fine dining, and the First Center for the Visual Arts. We are also a short drive from the airport. Our property is absolutely stunning with koi ponds, waterfalls, a 50×20 Roman pool, and an abundance of options to accommodate your meeting of up to 250 people. Also, up to 16 people can stay on the property making it perfect for corporate retreats. For events needing accommodations for larger groups there are numerous high quality hotels within a short distance of our estate. The Historic East Ivy is one of the only event venues in Nashville that will allow you to use your own vendors. You may also bring in your own food and alcohol if you desire. Give us a call today at 615-777-3964 to learn more.